Does anyone know how to make these awesome sandwiches? 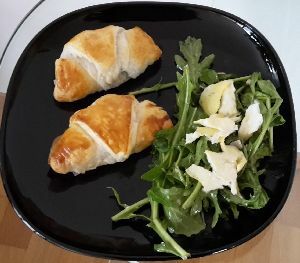 I buy those croissant breads with something in them, I think it is cheese + eggs, I am not sure but I hear people calling it "Croissant Jumbo" I could be mistaken but it is my favorite food now, so much so I really want to know how it is made so I can make the same thing again and again. Re: Does anyone know how to make these awesome sandwiches? Made in my office every morning, I love them!! They just take an uncooked flat croissant, a slice of ham and a slice of cheese, roll it into a croissant shape and cook it.. It's my little piece of daily joy with everything else breakfast related made of bread, chocolate or sugar! Yeah, I think you are right they are called "Croissant Jambon". I never even know what "ham" meant till today and I think that is whats inside. But sure, you can buy all of the individual stuff and experiment with the best ham and cheese combinations.. A little mustard, some egg etc..
You mean the puff pastry (blätterteig) or something else? Because that's how I make my filled gipfeli, but then you have to make at least 8 of them. Not very practical if you just want one..
Last edited by StelladOriente; 06.11.2018 at 20:48.
séré à la crème is quark. The full fat one! pâte feuilletée is flaky pastry, you find it in the cooler. Thanks your list is easy to understand. The migro site makes it sound like I will be making a new telescope for NASA. wheat flour , ham 30% (pork meat [Switzerland], water, nitrite salt for brine [cooking salt, preservative: E 250], stabilizers: E 450, E 451, glucose, sugar, antioxidants: E 301 and extracts rosemary, natural flavors), vegetable margarine (palm oil, rapeseed oil, water, emulsifiers: E 471, E 475, acidifier: citric acid), water, wheat protein , whole egg (farmed on the ground), sunflower oil, iodized cooking salt, wheat starch, modified potato starch, mustard (table vinegar, water, mustard seed , iodized salt, sugar, spices), skimmed milk powder, malt flour of barley, powdered condiments (with yeast, garlic), lactose , spices, sugar, antioxidant: rosemary extracts. I think I will go with yours. Migros sells pizza dough in little bags. I love that one! Can't find it on their website, I hope they didn't stop selling it. The deep frozen ones are industrially made. The ingredient list is accordingly disgusting. Of course there are ingredients you'd never put in!! DO NOTICE that I did not translate all the ingredients, so study the migusto recipe. Do not try to make them with the Migros floor. They would be hard and soiled. Buy flour instead. But don't bother, buy flaky dough, ready made. But really .. By the time you buy all the stuff.. You be cheaper and easier to buy the ready made, no? You can even buy them frozen. Unless it's just for the fun of doing it. Well, I made them as I wanted something quick, using the migusto recipe (and actually sticking to it, which is unusual for me ). They're nice. A next time I would put more spices into them (chilli & Co.) but that's me. Dead easy OP. (Maybe not looking as perfect as the one you bought but hey, you're the artist, go for it). Preheat the oven when you start mixing the filling to 200°C (C is what Swiss ovens show/do ). Put it on top-and-bottom heat. Don't take the flaky pastry out of the fridge until you're actually ready to form/fill the croissants. Shove them in in the middle of the oven. I did mine 20 minutes, it was enough. Recipe says 25 minutes. Remember to take Blätterteig / pâte feuilletée, I even used this cheap one today. It's great, it's even an octagon = how much easier to make 8 even triangles. The down side: If you plan to eat this every day - and maybe 8 a day, LOL - you will need new jeans very soon. The one in the backrgound are the ones I made. 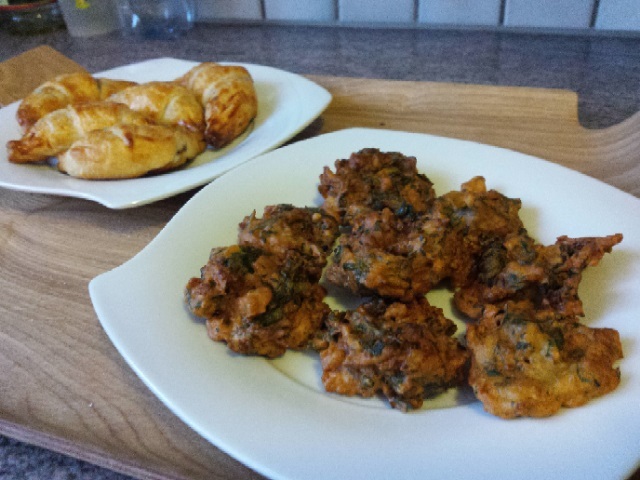 They don't look particularly tempting (and the pakoras in front even less ), but are very tasty: my usual filling is minced meat, green peas, potatoes, onions and various spices. I think the ones in the background are rather Samosas than "Schinkegipfel". Judging from the stuffing you mention. Very different thing. Very nice too. Gosh, I'm not supposed to be hungry now - I've eaten. If we're done with the "awesome sandwiches" (LOL) maybe we should move back to this thread. I just saw, StellaOriente has already moved back there and will make my evening more difficult.